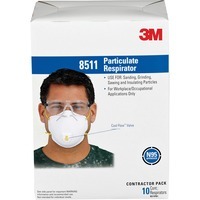 Particulate respirator features 3M Cool Flow Valve technology for heat reduction and easier breathing. Advanced filter media also promotes easier breathing. Use for nonharmful dusts from sanding, grinding, sawing and insulating particles. M nose clip allows fewer pressure points and greater comfort. Protection Paint Sanding Valved Respirator is NIOSH approved N95.